Some true crime stories are so horrific, that they are scarier than any horror film Hollywood can come up with. In February of 1993, Two ten year old boys took a three year old from a mall in England, bashed his head in with a rock, tied him to the train tracks, and watched as he was run over by a train. According to the law they were released at age eighteen, and disappeared under assumed names. 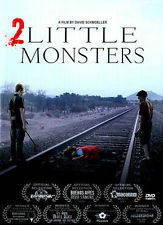 2 Little Monsters is a based on that event, speculating what these boys lives would have been like after they were released from prison. How hard would it be for them to hide their identities? Could they blend into society, having lived their whole lives in prison? This film answers those questions as well as following the paparazzi, who are in for a big pay day if they can find the boys and take their pictures. The idea here is very original and I was very much looking forward to this film, unfortunately, despite a lot of critical acclaim, nothing really happens. Yes, the boys are shy and awkward, and it becomes increasing difficult for them to hide who they were, but there isn't an urgency to any of it. This film moves at a snails pace and nothing substantial ever happens. The producers basically used the story of this horrible crime to sell DVDs, when truthfully they had nothing more to go on since the boys release. Everything is supposition, and it's probably very close to the truth, boring, predictable, and uneventful.